Krokodil is a street name for a desomorphine, a semi-synthetic opioid drug commonly synthesized from codeine. Similarly to heroin and other opioids, desomorphine also has a sedative and analgesic effect; it is highly addictive and potentially harmful. Krokodil is presumed to contain desomorphine, but due to illicit, home-based, manufacturing, it may also contain other unknown ingredients, or in fact, no desomorphine at all. Why is desomorphine drug called “Krokodil”? What is wrong with Krokodil production? Desomorphine is an old drug that re-appeared in the markets in the last decade as a homemade product. Its street name is “Krokodil” or “Crocodile” (Russian: крокодил) due to the scaly green colored, full of ulcers skin of addicts that emulates that of a crocodile or due to α-chlorocodide that is the first intermediate in the synthetic pathway of desomorphine . The jargon terms “Krok” or “Russian Magic” are also used. It is also called “drug of the poor” as it is used by those who cannot afford the more expensive heroin. Homemade versions of Krokodil drug begin with codeine, and can be ‘cooked’ similar to illicit methamphetamine (“meth”) production. Organic solvents such as gasoline, lighter fluid, or paint thinner, iodine, hydrochloric acid, and red phosphorus (from matches) are used in homemade synthesis. These dangerous substances are not always completely “cooked” out of the mixture when used to make illicit krokodil. Abusers who inject such caustic agents into their veins can develop extremely dangerous skin ulcerations, infections, and gangrene – a discolored (green, black) scale-like skin that resembles a crocodile. “Krokodil” is characterized as “flesh eating” or “flesh rotting” drug as it finally rots the flesh, leaving the bone and muscle tissue exposed to infections. 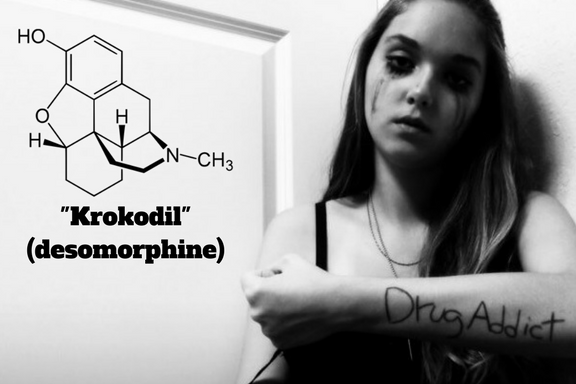 Desomorphine, known by the street name krokodil, is an opioid derivative of codeine. This compound belongs to the class of organic compounds known as morphinans. These are polycyclic compounds with a four-ring skeleton with three condensed six-member rings forming a partially hydrogenated phenanthrene moiety, one of which is aromatic while the two others are alicyclic. Desomorphine is not a new drug. It was first synthesized in 1932 in USA and patented in 1934. Its traditional synthesis includes the production of α-chlorocodide, by reaction of codeine with thionyl chloride, which by catalytic reduction yields desocodeine (dihydrodesoxycodeine). A final step of demethylation leads to desomorphine formation. However, this synthetic procedure has low yields and requires tedious reaction conditions. Recently, an optimized process for the synthesis of desomorphine has been described in the literature achieving higher yield and purity without obtaining impurities or by-products. This synthetic method affords the tosylate or mesylate product of codeine which by reduction of the 6- protected-hydroxyl group and hydrogenation (reduction of 7,8 double bond gives quantitatively and highly pure desocodeine. Desomorphine is finally obtained after demethylation of desocodeine with the use of BBr3 in acceptable yield and very high purity. The overall yield of this process is 38% and as no column purification is required at any stage, it can be easily applied in common laboratories. According to the stoichiometry of the reaction and the estimated mean yield, for the synthesis of 1 mg of desomorphine approximately 3 mg of a codeine salt (sulfate or phosphate) is required. Morphine can also be clandestinely manufactured as “krokodil” from codeine via a simple two-step synthetic procedure that can be applied at home or in the street since the process requires very little laboratory equipment and involves the use of low cost and easily available chemicals. A first step involves the extraction of codeine from relative over-the-counter pharmaceutical products (tablets), which can also contain acetaminophen or ephedrine (e.g. Codelac®, Sedal-M®, Code Vin® etc. ), with organic solvents (such as gasoline) after the initial addition of a strong base (potassium or sodium hydroxide). Hydrochloric acid is used to acidify the mixture and convert the codeine-base into its water soluble salt that resides in the aqueous layer. Although the 1 extraction process can be further repeated, many “manufacturers” and/ or users proceed directly with the next step that involves the reduction of the extracted codeine with iodine, hydrochloric acid and red phosphorus, through an intermediate reaction (formation of α- chlorocodide), to desocodeine which is then demethylated into desomorphine. According to the Erowid data, this simple one-pot reaction may take up to 45 min and the final product is often contaminated with various toxic and corrosive by-products or residuals. Thus, synthetic analogues of codeine, other drugs such as tropikamide, ephedrine or acetaminophen (often found in codeine containing preparations), phosphorous, iodine or even heavy metals like lead can be found in the “krokodil” street samples, as a result of poor synthesis. All these substances are considered to be responsible for the most of the undesirable or toxic effects that appear after the repeated injections of “krokodil” which actually is a cocktail of all the above substances; desomorphine, by-products and residuals. The desomorphine content of “krokodil” samples may range from traces to 75%. The Russian Internet news page NOVOSTI (Russian News & Information Agency) reported that desomorphine first emerged in the Russian drug scene around 2003 under the term Krokodil. Thereafter, an epidemic increase in the number of addicted individuals was observed. As hypothesized by Russian media, the reason for the rapid increase seems to be the unproblematic availability of Krokodil resulting from a simple production process that can be accomplished at home for little cost. Due to these circumstances, almost all current desomorphine users are claimed to be former heroin users who switched to Krokodil. In the first quarter of 2011, 65 millions doses of desomorphine were seized in Russia. Currently, 100,000 of 2.5 million individuals in Russia with substance dependence seem to have desomorphine addiction. However, the actual number could be higher than reported. Due to this dramatic development, it was concluded that in Russia, codeine-containing tablets, which are the chemical basis for the home production of desomorphine, were to only be available in pharmacies. Today, it has been estimated that around 100,000 people use “krokodil” in Russia and around 20,000 in Ukraine. Its use appears to grow among people who inject drugs in Kazakhstan, Georgia, Germany, Czech Republic, France, Belgium, Sweden, Norway, New Zealand, as well as in USA. Who abuses Krokodil the most? The victims of “krokodil” are usually young people aged between 18 and 25, previous users of heroin that come from middle-class backgrounds. They turn to this drug for economic reasons, although some of them also claim that they are/were not aware of what they use, thinking of abusing heroin. The main reason for the spread out of “krokodil” is obviously the simplicity and accessibility of its preparation. Indeed, tablets of over-the-counter codeine, which usually contain also acetaminophen, could be purchased for a few dollars and the quantity of desomorphine produced could substitute for about 5 times worth of heroin. Why would anyone use Krokodil? The drug costs about a tenth of the price of heroin and it is incredibly addictive. If a person begins using it and then decides to quit, he (or she) faces a grueling withdrawal period. This means they will be forced back into using the drug unless they can get drug addiction treatment immediately. Recovery is challenging, but it has been shown in Russia that recovery from krokodil addiction is possible. Results of animal studies showed that desomorphine exhibited higher and faster pain-relieving (analgesic) effect, more potent gastrointestinal mobility and general depression than morphine. This phenomenon was attributed to the lack of the alcoholic hydroxyl group in desomorphine and its substitution by hydrogen. This lack makes also as a consequence desomorphine to be more toxic and more convulsant. 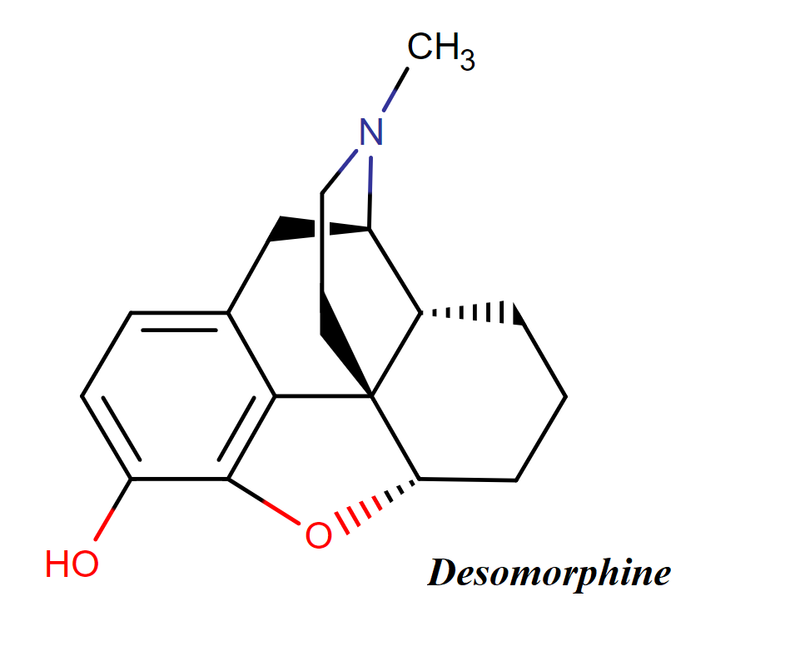 Its reported effects in animals and its structural similarity to morphine suggest that desomorphine is a potent μ-opioid agonist, with less activity on κ- and δ-receptors, including euphoria, sedation and analgesia (positive effects). It has the further advantage of being almost entirely free from the emetic and other effects of morphine on the gastrointestinal tract. The hydrogenation of the double bond leads to such an increased action. This structural modification in combination with the absence of the 6-hydroxyl group of the cyclohexyl ring, that renders desomorphine more lipophilic than morphine and favors its penetration in the brain, possibly explains its 10-fold higher analgesic potency than morphine and its faster analgesic effect. Although desomorphine has ten times the analgesic power and fifteen times the depression effect of morphine, it has only three times the toxic power of it. Desomorphine was originally synthesized in order to create a substitute to morphine as far as it concerns not only tolerance and addiction but also its side effects like narcotic action and respiratory depression. However, when desomorphine was tested it showed an increased dependence potential compared to morphine. A significant number of clinical human studies verified the analgesic potency of desomorphine as well as its dependence potential. This increased dependence potential can be explained by the fact that it shows a faster onset of action and a shorter elimination half-life when compared to morphine. Can desomorphine (an active ingredient from Krokodil) be used for the medical purpose? Three independent human studies on the clinical use of desomorphine reported satisfactory relief of pain either in cancer patients or in pre- and post-operative cases of trauma or accidental injury. The first published report on the clinical use of desomorphine verified its 5 to 10-fold higher analgesic potency than morphine that appeared more quickly earlier and lasted less than the latter. Dizziness and vomiting were less frequent with desomorphine than with morphine, but respiratory depression was sometimes greater. Furthermore, its sedative effect and its effect on intestinal peristalsis were less than those of morphine. According to a study performed on cancer patients, 1 mg of desomorphine was equivalent to 10 mg of morphine for pain relief. The relief per dose also averaged 2 h and 25 min for the former and 3 h and 7 min for the latter. Desomorphine produced quiet or light sleep to patients who had suffered an accidental injury, but they could respond, speak, co-operate. It also gave complete relief with relaxation for 5 or 6 h without the occurrence of nausea or vomiting. Due to the significantly shorter half-life than its opioid analogs and the sharp increase in addiction rates of other opioids, desomorphine was considered for decades to be a compound with no medicinal value. Nevertheless, desomorphine due to its strong physical and psychological dependence potential and the fact that it can lead to an irreversible destruction of the organism when used as “krokodil”, has attracted a regenerated medical interest during the recent years. How is Krokodil most commonly abused? Desomorphine, in the form of “krokodil”, is ingested orally or, most commonly, injected subcutaneously, intravenously or into the femoral artery as an impure liquid. This liquid is actually a cocktail of unknown composition where desomorphine can range from traces to 75%. This results in a wide variance of the ingested doses, depending on the purity of the substance and the user’s tolerance. When Krokodil starts to work? How long effects last? Krokodil users experience euphoria just for approximately an hour and a half, while the “pharmacological” effects of heroin use can last 4 to 8 h. The withdrawal symptoms, which are similar to the ones from heroin, may last up to a month. Thus, the short duration of action and the less than an hour time required for the home preparation of “krokodil” lead its addicts that prepare the drug themselves to be trapped in a 24-h daily cycle of “cooking” and injecting in order to avoid withdrawal. So, “krokodil” abuse can be characterized as a full-time job. By the end, the addicts are staggered out yellow, exhausted and stinking as the smell of iodine infuses their clothes. The toxicity of by-products and residuals of the manufacturing process along with dirty needles and poor injection technique can lead to a slew of horrific consequences that are not related to the opiate effects of desomorphine but to the toxic effects of impurities in “krokodil”. Indeed, the synthetic method followed for the production of homemade desomorphine yields an impure, orange-colored liquid contaminated with various toxic and corrosive by-products or residuals like paint thinner, lighter fluid, gasoline, lead, zinc, hydrochloric acid, iodine and/or red phosphorus that are used for its preparation. Since this homemade cocktail is routinely injected with little or no purification, it can cause immediate skin irritation and ulcers, a discolored (greenish) scale-like appearance, similar to that of a crocodile’s, destruction of skin and severe muscle and cartilage tissue damage. Thrombophlebitis can also appear. The presence of gasoline and hydrochloric acid still in the finally injected liquid solution is considered responsible for these damages. Once the skin around the injection site is damaged, the area becomes a target of gangrene. This leads to skin and muscle decay around the injection site, and, in time, the skin sloughs off due to the rupture of the blood vessels, often exposing the bone below. The same effects are also caused by the presence of phosphorus that is usually scraped from matchboxes. The damaged tissues are susceptible to infections that may lead to inflammation, abscesses and rotting as this flesh-eating drug kills slowly from the inside out. In most of the cases, extensive amputation is the only solution. High concentrations of iodine in the injected solution disrupt the endocrine system, causing thyroid disorders, while high concentrations of heavy metals such as iron, zinc, lead and antimony attack the nervous system (resulting in speech and motor skill impairments, affected memory and concentration) and lead to inflammation and shut down of liver and kidneys during chronic use. Lemon (2013) describes the use of homemade desomorphine as a possible cause of hallucinations, unlike heroin, although no further information on the subject is given. Intravenous injection of street “krokodil” can also cause life-threatening bloodstream infections, coronary artery burst, septicemia and other systemic damage due to infections, such as pneumonia and meningitis. In addition, according to health authorities, hepatitis C and HIV are reported in a great percentage of “krokodil” addicts through the use of contaminated needles. The use of “krokodil” leads to a mean survival time of 1 or 2 years, while the respective time for heroin could be up to 20 years. It has to be noticed that many “krokodil” abusers die within the first year of use since it is estimated that life expectancy is reduced approximately a year for each dose of the drug couple of hours and in urine samples within 2–3 days after “krokodil” administration. Krokodil is very addictive, and dependence can develop right after the first use. This is prompted by the fact that its half-life is short and the euphoric effects last for less than two hours. As a result, frequent injection is necessary to recreate the “high” as well as to avoid the withdrawal symptoms. The need to consume large amounts of the drug on a more frequent basis can prompt binge patterns where users lock themselves up in the apartment or the home to “cook” Krokodil and use it repeatedly. It has been said that being a Krokodil addict is a full-time job because of the cyclic patterns of cooking and injecting. In addition, modifications in the ingredients and cooking process place a user at an increased risk of overdose and death. Krokodil use reduces life expectancy by two years. An addict is most likely to die from a fatal overdose or from the complications arising from Krokodil use within two to three years. To date, no other drug causes the same destruction that Krokodil does. While it affects the brain in a manner similar to most drugs – by targeting the neurotransmitters that associated with pleasure, learning, and memory – the long-term effect of Krokodil addiction leaves a damaging mark. Most Krokodil addicts fail to fully recover their motor skills and their eyes assume a vacant, distant look. Going through the withdrawal phase can be very painful. The symptoms and physical discomfort may last for more than a month from the cessation of use. A person who displays the signs and symptoms of Krokodil abuse or withdrawal needs immediate medical and psychological attention. Since the life expectancy of chronic users is significantly reduced, a delay in seeking professional help could have fatal consequences. Several treatments and rehabilitation centers offer intensive detoxification and recovery programs that could help users beat the addiction. These programs include medically managed detoxification, behavioral therapy, counseling sessions, and physical therapy for those whose motor skills have been impaired. Because Krokodil has one of the highest relapse rates among opiates, enrollment in a long-term inpatient therapy is strongly recommended to help an addict sustain abstinence and regain control over his life. While the effects of Krokodil abuse can be extensive and may last a lifetime, a timely rehabilitation can, at least, save the addict’s life. Confronting a family member, colleague, or friend who has a dependence on Krokodil can be very challenging but a slight delay may be fatal. It is crucial that help is sought as soon as possible. Can Krokodil be detected via standard drug tests? Desomorphine intake can be detectable by all standard urine screening approaches, mainly via the parent compound and its glucuronide. Therefore, desomorphine intake can be detectable by all standard urine screening approaches, mainly via the parent compound and its glucuronide.